Bristol City striker John Akinde has completed a loan move to Dagenham & Redbridge until the end of the season. The 21-year-old has played 18 times for Bristol Rovers this term during a goalless four-month loan spell. Akinde has made just one league start for City since joining from Ebbsfleet in September 2008. "There was a lot of interest in John and he's opted for this loan move to Dagenham," Robins boss Keith Millen told the club website. "Hopefully he'll go there and get some first team games under his belt. He needs to give his career a kick start." 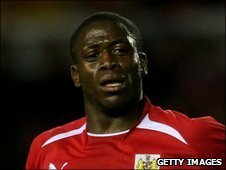 Akinde cost City £140,000 when he made the switch from non-league Ebbsfleet, where he scored 12 goals in 34 games. He has since had loan spells at Wycombe and Brentford before heading to the Robins' city rivals.